The PhotoMed / Fuji S9000 clinical camera system is a hybrid or "bridge" camera between the smaller point-and-shoot cameras and the larger SLR cameras (like the Canon 30D). The S9000 allows you to use the built-in LCD screen as a viewfinder (like the Canon A620) or switch to the elctronic viewfinder and place your eye to the viewfinder (like the Canon 30D). The S9000 features a 10.7x optical zoom lens. 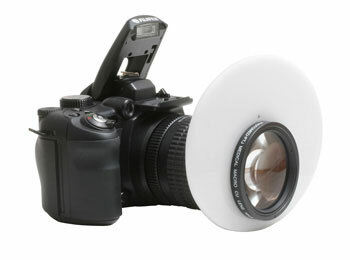 When combined with PhotoMed's custom macro lens, this camera can focus on a field only 5/8" wide. The other nice thing about the S9000 lens is the manual zoom control. This allows you to preset the lens at any position and shoot the same size field over and over (just like an SLR camera). There are others who's information wasn't available in time for this issue. These links will be added to our web site and updated regularly. or a credit towards a new digital camera system. Peter is our used equipment evaluator. Call him with the make and model of your camera equipment and he will give you an estimate of what it is worth. Call Peter at 800-998-7765. Visit PhotoMed at the Pacific Northwest Dental Conference in Seattle, WA, July 13-14. We will be in booth #1001. We'll be showing all of our cameras including the new Fuji S9000 Clinical System.